This past Friday I drove my work to be crated and shipped. So many pieces and thingies – 47 pieces total. All the while leading up to this exchange, I’ve been admiring the levity and space of conceptual art. Wouldn’t it be nice, that like artist Berndnaut SmildeI, I could simply create cloud vapors in rooms. Or like Yves Klein I could keep the gallery walls white, and simply serve cocktails that would later turn my guests pee blue. But no, this time around, I’m sticking with painting, photographs, letters and drawing. So in thinking of the immaterial and the material of things, with a West Coast flavor, I dedicate this post to John Baldessari – whose lightness of being, sense of humor and brave projects I adore. Here is a brief history of his work (5 minutes) narrated by Tom Waits. Also an excerpt of one of my favorites of his where he sings from a catalog of Sol Le Witts work. It is worthwhile to note that in his career (I believe he was around 40 or so) he burned all of his paintings in the Cremation Project. At the beginning of the “This Not That” documentary they show him destroying his canvases (ripping, jumping on and slashing) before he puts the crumpled lot into a crematorium**. Hmmm. 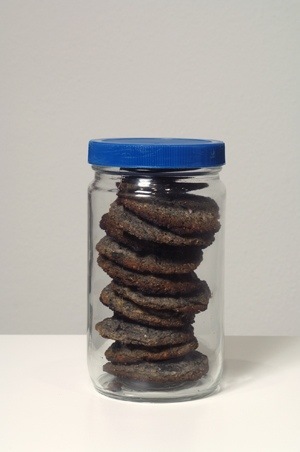 Cookies baked with ashes from “Cremation Project,” 1970. Courtesy of Artist and Galleries. ** A postscript to note that although John Baldessari destroyed his paintings in an effort to be released from its reigns, now in his 80’s he has returned full swing to large, two-dimensional pieces all about color and composition. We always return to our passions it seems.